Google chrome is a great lightweight Internet browser that keeps the Internet browser experience as simple as possible. If you browse the Internet browsers like Google Chrome allow third-party websites to store your information in cookies. 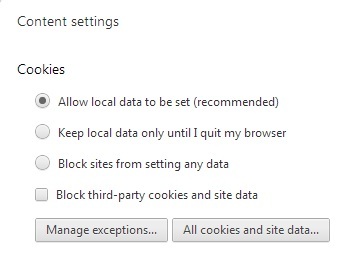 If you want to disable cookies in Chrome follow the simple steps outlined below. 1. Open Google Chrome. Click on the Settings icon . Choose Settings in the drop down menu. 2. Click on Show advanced settings... This will open up the Privacy Settings for Google Chrome. 3.A overlay will show you all the options associated with Google Chrome cookies. You can use this screen to disable cookies in Chrome. 4. Select Block sites from setting any data. This will disable cookies in Chrome. Also select the checkbox Block third-party cookies and site data to block any attempts by websites to set cookie or site data such as location, etc. If you are using Chrome in iPhone, be sure to disable cookies in Chrome on iPhone as well.